PhotoGearNews’ Lok Cheung takes a look at the Yi 360 VR and the Yi Halo. Lok Cheung is well known to photographers as the former colleague of Kai Wong at DigitalRev (before they both left). At DigitalRev, Lok was the one who was most interested in 360 cameras. Anyway, he’s now at PhotoGearNews. 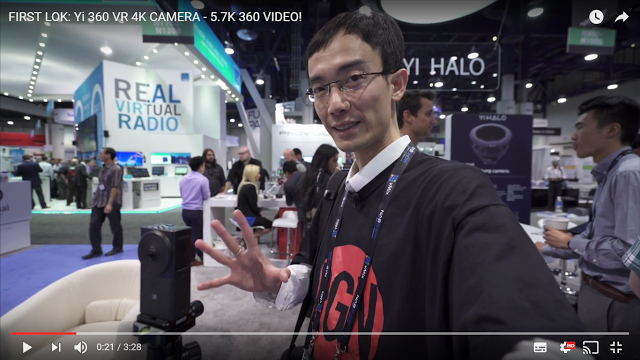 In case you missed it, I also have a video from NAB about the Yi 360 VR. Too bad I didn’t run into Lok when I was at NAB. Kai posted a comment on my old blog one time. It would have been nice to say hello. Perhaps next time! I think you are in the background! Hi Rich. I don’t see myself in that video but maybe I missed it!